San Juan Bautista is a small agricultural town in California with numerous points of interest, including Spanish missions dating back to the 18th century and adobe houses dating back to the time when Alta California was a province of New Spain predominately populated by native Ohlone Indians. However, while the area is rich in Spanish, Mexican and Native American history, one of the most intriguing chapters in the history of San Juan Bautista is the strange life of Marie Prieto Costillo-- a beautiful Mexican woman whose seven husbands all met with terrible and unusual deaths in the latter part of the 19th century. And, perhaps stranger still, the supposed curse of the Black Widow of San Juan did not discourage potential suitors; her reputation and destructive beauty were rumored to be so great that men continued to beg for her hand in marriage, long after her last husband was dead and buried. 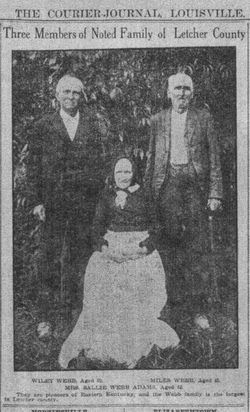 Marie Prieto was nineteen when she married her first husband, a young cattle rancher from Rancho Jurista named Jose Cassela, in 1880. The union, which lasted for just two years, was brought to an abrupt end when Jose fell from a wagon while driving from Hollister to Sargent Hill on an unseasonably cold night. He was still clinging to life when he was found the next morning, and it was determined that Jose had died from freezing to death, rather than the injuries he sustained in the accident. Marie spent a year and a half in mourning before she married again, this time to a young man named Manville Harris, who was the son of a prosperous shopkeeper. The couple had been married just eight months when Manville, while clambering over Sargent Hill, slipped down a steep grade and suffered a broken leg. Manville's recovery seemed certain until blood poisoning set in. Three years passed before Marie wed again, this time bestowing the honor upon Felipe Helmuth, a middle-aged miner who was described as rather ordinary in appearance and wealth. This union lasted only five weeks; Helmuth lost his life in a tunnel cave-in in 1886. Marie, who inherited a few thousand dollars from her deceased husband, decided to get away from San Juan for a while after rumors began to spread about her reputation. Although Marie couldn't possibly have played a role in any of the deaths of her three husbands, she felt that a long vacation was in order. In spring of the following year, while touring San Francisco, Marie used the remainder of her inheritance to rent an apartment on Bush Street, where she lived happily-- and single-- for four years. Although Marie was still young and beautiful, she rejected each and every advance until she met and fell in love with a promising stage actor named William Storey. Marie, however-- being quite religious and old-fashioned-- refused to marry an actor, and William promised that he would give up the stage for good if only she would marry him. They were married in 1891 and, true to his word, Storey gave up the life of a thespian and moved into a small ranch in San Juan. It was February of 1891 when the couple left San Francisco, and William Storey immediately fell in love with the hills and canyons of San Benito County. Storey, who was effectively killed by his own echo, suffered perhaps the strangest death of all Marie Prieto Costillo's husbands. Near San Juan there is a canyon which the Indians called "Speaking Canyon" because of its unique acoustical properties-- even the faintest whisper is amplified to such a degree that it scares the wits out of anyone who is not familiar with the locale. It was believed that Storey, after hearing the ghastly echo of his own voice, became frightened and began to cry for help. These cries produced their own echoes and Storey soon found himself surrounded by a swirling, invisible chorus of sounds which surely must have seemed otherworldly to an urban dweller. He was found at the bottom of the canyon a few days later, dead from a self-inflicted gunshot wound to the head. In June of 1892 Marie wed an Englishman by the name of George Prouter, who promised to take her back to England where, he firmly believed, the curse would be broken. Prouter was killed six weeks later in a hunting accident. Two years later she agreed to marry an old acquaintance, a miner named Beam Campbell. The following year Campbell was inside a mine elevator in Angel's Camp when it fell and its occupants were dashed to a mangled mass at the bottom of a 1,000-foot shaft. 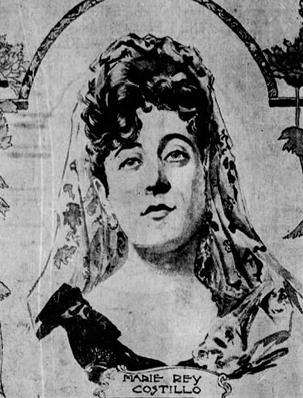 Marie Prieto married for the seventh and final time in 1895. Her husband, Rey Costillo, died just twenty-eight days later, after falling into quicksand in Amador County and suffocating. And so ends the tragic story of Marie Prieto Cassela Harris Helmuth Storey Prouter Campbell Costillo, who lived out the remainder of her life in quiet solitude. Was Marie cursed? Punished by a Higher Power to expiate the crimes of her ancestors? Or was she simply one of those people who, for some unknown reason, seem to be a magnet for death? San Francisco Examiner, Feb. 12, 1899. Xenia Daily Gazette, Mar. 14, 1899. Buffalo Times, July 5, 1908.